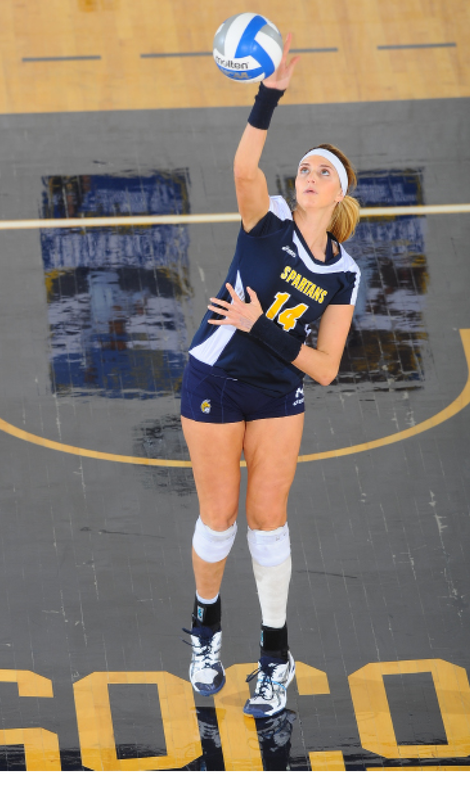 Though the first home game for the UNC-Greensboro Spartans Volleyball team will not be played until September 8 when they host the High Point Panthers, the first volleyball game that was played in Fleming Gym this semester occurred this past Saturday afternoon. It was on this day that the Spartans Volleyball program held their first (and hopefully not last) Alumni Day. The game featured seventeen alumni to the volleyball court and an entire day of activities that brought together so many familiar faces for just a simply day of UNCG volleyball. To start the festivities, the team held a meet and greet luncheon for fans, featuring players from the past and the current batch of Spartan volleyball players. After the meet and greet, the past players for the Blue and Gold were taken on a tour of the campus to re-live past nostalgic memories and to witness some of the new dorms and buildings built since they left the university. By 2pm, the players begin to warm up for the match and a half an hour later, the sides were ready to rumble for a volleyball contest which went across generational lines. After the game, both rosters ended with a post match lunch and celebration. Despite the party like atmosphere at Fleming Gym, Westerbur, with the former volleyball players at UNCG and her current teammates, were just as ready for a game as they were for the happy festivities that the day brought. Despite the fact the game on Saturday was merely an exhibition, Westerbur was still as excited for the match as she would be for a game against Southern Conference foes like Western Carolina or East Tennessee State University. For all the fun, games, and friendly competition between the teams, Julia did say how she felt that the match can benefit the current batch of Spartan volleyball players, especially the younger players. And of course, the most important part of an alumni game, the year long bragging rights for the winning team. “I talk to a few alumni and I would not say we beat you” Julia explained while laughing at the question, “but you could say that there are bragging rights.” Because what is the fun of playing your friends if you can joke around about the game after it is over. In preparation for the new season following the Alumni Day on Saturday, the head coaches of the Southern Conference ranked the Spartans third in the conference in a preseason poll. The team received 54 points, only four points fewer than the Furman Paladins and the Furman Bulldogs who finished tied for first in the ranking. Also announced that day was the Southern Conference Volleyball Preseason All-Conference Team, which featured two Spartans: server Sara Hohman and defensive specialist Katherine Santiago. The team’s season kicks off this weekend, when the team travels to Liberty University for the annual Liberty Invitational. According to anyone and everyone who attended to match, the game was a huge success. And like that, a new tradition was established at UNCG, the annual Alumni Volleyball match.